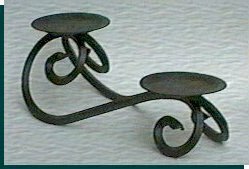 Wrought iron candle holder of a transverse section squared with availability to include two candles, in whose outlines is appreciated the Scandinavian touch that heightens to the iron. The complete final that it can reach the iron is of several types: antique gold, turquoise, black - green, dull black, etc. ; and the can be appreciated of better way here.